The 10 Best Bars in North Dakota! Few things can tell you more about an area than its nightlife. If you are new to an area, check out the bars to get an authentic taste of the community vibe. When visiting North Dakota, stop in to one of these bars and you’ll get a sense of what it is that makes the state great. Here are the 10 best bars in North Dakota. Parrots Cay is a bit of a cult favorite in Grand Forks. From the unique atmosphere to the arguably best wings in town, Parrots Cay is worth a stop when in Grand Forks. Serving beer from over 36 taps, the restaurant is also home to one of the most intense hot wing challenges you will find. If hot is not your style, Parrots Cay also serves a full menu. Fargo/Moorhead’s original Irish pub, Dempsey’s is home to a wide variety of appetizers and some of the best artisan pizza around. Nightly entertainment includes live music or karaoke and an assortment of bar games. Upstairs you will find the aquarium, one of the Fargo’s hottest live music venues. If you are looking for a little action with your food and drink, this is the place for you. Billed as North America’s largest billiards hall, the venue hosts 56 pool tables. Just because it is known for its entertainment value does not mean that it isn’t home to delectable food and cool drinks. Offering both elegant meals and good ol’ burgers, this gastropub’s menu has something for everyone. Old Broadway has been one of Fargo’s hottest nightclubs for decades. With a combination of delicious pub food, a wide variety of drinks, and an electric atmosphere, the bar will stay that way for many years to come. The OB Sport Zone is the premier destination for catching the big game the OB Nightclub is the place to unwind after. If you are looking for an energetic bar that is a step down from a loud and hectic nightclub, stop by Joe Black’s. 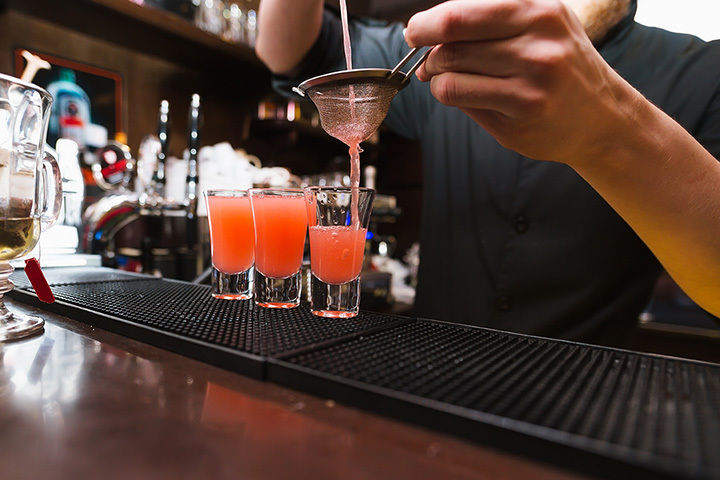 With a food and drink menu that is second to none and a friendly and welcoming atmosphere, you will quickly see why the bar and grill quickly became a favorite among Grand Forks residents. For those more interested in testing their luck than shaking their booty, a visit to Southgate may be just what you are looking for. Take top-notch food and drinks in an electric atmosphere and add bingo, pull tabs, blackjack, and the Pig Wheel. What more do you need? Check the website for daily specials and events. Interested in cool drinks and a hot dance floor? Check out The Landing on your next visit to Minot. With a rockin’ DJ and live events monthly, The Landing is widely considered the hottest bar in Minot. If you have a craving for authentic Irish cuisine, Ebeneezer’s is the place for you. And with a wide variety of beer, wine, and mixed drinks, you can easily whet your whistle while you satisfy that craving. Check out the website for daily drink specials and special events. For those looking for good food and drink in a relaxed but exciting atmosphere, a visit to Humpback Sally’s should be on your list. Specializing in small-plate foods that invite experimentation, Humpback also offers a wide variety of traditional and specialty drinks. If you are looking for a great night on the town without the hearing loss of dance clubs, check out Humpback Sally’s. Enjoying a night on the town doesn’t have to mean forgoing elegance. Peacock Alley offers a variety of elegant menu items, including their signature Cowboy Ribeye, as well as a wide selection of drinks. Peacock Alley is known for their martinis, which includes everything from the Turtle Cake (Dorda, Smirnoff caramel vodka, Disarrano, and cream) to the Caramel Apple (Smirnoff and caramel Apple liqueur).